Quailhurst U.S.A. has recently purchased “Abamba,” a weanling filly by dressage talent Samba Hit I (by Sandro Hit x Brentano II) out of the Goodtimes daughter Ulocia. Abamba was purchased at the Prinsjesdag foal auction this past September and is due to arrive at Quailhurst sometime in November. Last year, Ulocia’s son Zalzatime (Painted Black) was auctioned for the record amount of 96,000 euros at the Prinsjesdag foal auction. 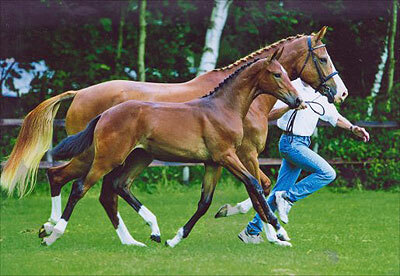 Grandam Lalocia is, just as the Grand Prix dressage stallion Nourejev (Cocktail), bred out of the mare Badette (Ramiro Z). Badette is a full sister to the international show jumper Piquet of Paul Estermann. The dam line continues back via Farn, to the mare Ibelocia (Fresco x Sinaeda) of NL mare line 055. Ibelocia is also noted as grandam to the international show jumping horses Edelman B and Mr. Higgens.